All beverage-related trademarks are owned by PepsiCo, Inc., its subsidiaries or affiliates. 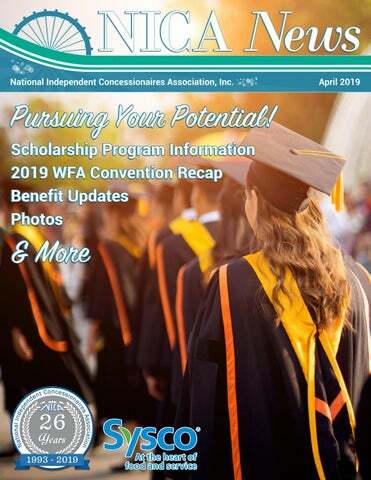 Contents • April 2019 Articles & Features 04 This Month’s New & Renewal Members 05 President’s Message 05 Director’s Voice 07 Card’s Corner 07 Member Benefits Spotlight 08 Association Announcements 09 The 2019 NICA Membership Contest is Off and Running 11 Thoughts from a CCE 12 Lettuce Talk About Produce 14 Growing Our Social Media 16 The Remix in Reno 20 2019 Business Expo & Food Show Moments You May Have Missed! 21 You Can’t Stay in Your Corner of the Forest Revisited 22 SYNERGY: Kindness Encourages Repeat Business 24 From the Camera Roll... 26 Pursuing Your Potential! Do you have any questions for us? Contact us at (813) 438-8926 or nica@nicainc.org today! Reach your targeted audience through national exposure to key decision makers including Concessionaires, Fairs, and more! Gain name recognition via our publications, website, and sponsorships available at Industry events; ask for more details. Receive a superb value through quality marketing opportunities. We have a variety of sizes to suit your ad—contact us at (813) 438-8926, communications@nicainc.org, or www.nicainc.org/advertising for additional information on sizes, prices, bulk rates, and more! Announcements Do you have any announcements that you would like to share with the membership? The deadline is the first day of each preceding month for your target issue. Contact us at (813) 438-8926 or nica@nicainc.org today! Are you ready for a rush in credit card sales? As a valued member of NICA, you can get great savings on credit card processing. NICA and First Data® have teamed up to make doing business easier by letting you securely and reliably accept more payment types and appeal to more customers credit, check, cash, debit, gift cards, mobile pay, and more. With a First Data payment processing account, you get: • Low Preferred Rates – As a NICA member, First Data helps you keep more of each transaction with no early termination fees. • Reduced Equipment Pricing – As a NICA member, you receive reduced pricing on the Clover Business Solutions. • 24/7 Customer Service – Your business never stops, so neither does our support. • Security and Reliability – Help your business be EMV® and PCI compliant with industryleading security. • Trusted Global Payments Leader – We help businesses around the world with simple solutions that drive success. © 2017 First Data Corporation. All Rights Reserved. The FIRST DATA and CLOVER names, logos and related trademarks and service marks are owned by First Data Corporation and are registered or used in the U.S. and many foreign countries. EMV® is a registered trademark or trademark of EMVCo, LLC in the United States and other countries. www.emvco.com. All trademarks, service marks and trade names referenced in this material are the property of their respective owners. Thoughts from a This month’s Statements of Communications & Management Philosophy are from our 2019 inductees: Vincent Nelson, CCE, Secretary, Jeff Ross, CCE, Ross Concessions, and Kathy Ross, CCE, President. Jeff Ross, CCE TEAM: The old saying that there is “No ‘I’ in team,” would sum up my Philosophy of Communications and Management. •	T: Teach— a person cannot perform a job without just being taught the job. •	E: Evaluate— tell the person how they are doing; shake the good, the bad, and the ugly. •	A: Assist— help the person, side by side. Most people, when shown a procedure, can repeat it easily. •	M: Mentor— continue to support them in the job and offer to stand by their side until the job is done. Regular unstuck Hot Dogs are available. Follow us online for the latest announcements! “One of the cool things that Phil Teague did was, he came out and actually worked in our business...” -Ryan Kuzma, Linn Enterprises Inc.
Sysco is proud to be the partner of choice for all of your foodservice supplies. We welcome the kick off to an exciting Fair Season! Go to www.sysco.com to learn more and find out how we can meet your unique needs. Congratulations to Fare Foods for celebrating 25 years! and raw were the emotions of that moment that I was left unable to speak and had to take a break until I could compose myself. As is often the case, we had left an impression on one another that neither will ever forget. And I was reminded once again that Fairs are really in the business of “making memories.” The relationships that have been initiated by these efforts may or may not contribute to an immediate sale, but they definitely help to drive future Fair attendance and thereby future business. Every interaction you have with a Fairgoer is an opportunity to form a lasting relationship, one that impacts business year after year. What can you and your staff do to create positive relationships? How you answer can shape your Organization’s future, as well as that of your Fairs! ▲ For more than 25 years, Jeff and his wife, Jo, have owned and operate Pristine Systems, Inc. dba “Gadgets And Neat Stuff,” a Commercial Exhibit business selling small tools at State and County Fairs. With over 65 years of insurance expertise, K&K protects concessionaires and vendors with affordable coverage designed for your needs. And when claims occur, our colleagues are here to respond quickly and effectively. Visit our website to quote and buy online. Heather Sattler, CCE, Sattler’s Leather and Hats, won a free membership! Nathan and Madina Marcus, West Coast Weenies, with their tickets. They were married in November 2018 and they won the Opportunity Drawing. Congratulations! On March 5th, we joined together to support the Indian River Firefighters Benevolent Fund, OABA and NICA. We gathered at the Bigshots Golf Center in Vero Beach, FL; everyone had a great time playing golf and networking! Dominic Palmieri, CCE, Past President, doing what he loves to do most: making a delicious meal! Rusty Groscurth, Super Dog, celebrating 65 years! WE DELIVER! With our warehouses centrally located in Tampa, Florida and the Midwest, Fare Foods is able to deliver to events on site in 44 different states. Our customers value our friendly customer service and appreciate consistent delivery of product to their events throughout the year. Email us at customerservice@mrgsmeats.com or call 800-444-6747 to order samples. For 60 years we have offered only the highest quality meat products. *Referral listing as of 2/28/19. Contact us if you see any inaccuracies. See back cover for rules and prizes. 800.235.8774 www.alliedspecialty.com XL Group and Allied Specialty Insurance are global brands used by XL Group Ltd’s insurance subsidiaries. Coverages are underwritten by the following XL Group Ltd insurance companies: Greenwich Insurance Company, Indian Harbor Insurance Company, XL Insurance America, Inc., XL Specialty Insurance Company and T.H.E. Insurance Company. Coverages not available in all jurisdictions. Although these dates are based on sources believed to be reliable and true, they are subject to changes throughout the year. Visit our calendar at www.nicainc.org or view upcoming NICA News for updates, changes, additional dates, and more! MEMBERSHIP APPLICATION q	Mr.	q	Mrs.
A person or entity who provides services to the concession industry. 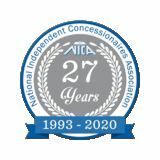 Concession Business / Group Membership Includes five memberships in one: one Independent Concessionaire, one Additional Member, and three Employee Members ($475 value). Business Description Provide a detailed description of your business, products, and/or services below. This information will be used for your entry in the annual NICA Membership Directory and as keywords to search for your business on the NICA website. The NICA-sponsored $10,000 AD&D Insurance Policy is provided to Independent Concessionaire, Additional, and Employee Members. Beneficiary : _________________________ Phone : _____________ If accepted for membership in NICA, I hereby agree to abide by its by-laws and rules. Signature of Credit Card Holder q I authorize NICA to charge the agreed amount listed above to my credit card information provided above. I agree I will pay for this purchase in accordance with the issuing bank cardholder agreement. q I authorize NICA to make automatic renewal payments for my membership using the credit card information above. I shall update NICA with all changes to payment information or my intent to cancel automatic renewal payments prior to my next renewal month.